Tens of thousands of people have rallied in Rome, demanding the resignation of Italian Prime Minister Silvio Berlusconi. 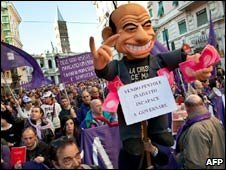 The No B (Berlusconi) Day march was organised by grassroots groups via the internet and social networking sites. 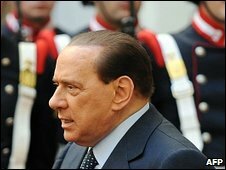 Mr Berlusconi faces separate tax fraud and bribery trials after he lost his immunity from prosecution in October. He denies the charges against him, insisting he is the victim of magistrates with a political agenda. Protesters chanted "I have a dream - Berlusconi in jail" during the march in the Italian capital. "This is a day of democracy, a day that shows that the country can come together to build an alternative and most of all to tell Berlusconi to go," Antonio di Pietro, former anti-corruption judge and now an opposition leader, was quoted as saying by Reuters. "There are people from all over the country here, and even from abroad with one message: Berusconi has to go!" he added. Organisers claimed that at least 350,000 people took part in the march, although police put the number at about 90,000. Actors and writers were among those taking part, including Nobel literature laureate Dario Fo, Reuters reported.